This is a vegetarian and vegan butternut squash and carrot soup recipe made from fresh butternut squash (you can use frozen, but it won't be quite the same), carrots, the usual soup ingredients such as vegetable broth, garlic and celery for flavor, as well as fresh chopped sage and a bit of soy milk to make it nice and creamy. If you need it to be gluten-free, just be sure to use a homemade or gluten-free vegetable broth, as all of the other ingredients are completely gluten-free. First, in a large soup pot, sautee the diced onion and minced garlic in olive oil until the onions turn soft, about 3 to 5 minutes. Next, add in the sliced carrots and celery and cook for another 3 to 5 minutes just to give the carrots and celery a bit of a head start. Next, add in the chopped butternut squash and give it all a squick stir just to coat the butternut squash with oil, then add in all of the vegetable broth and chopped fresh sage. Bring the soup to a boil, then reduce heat down to a slow simmer and allow your soup to cook for at least 25 minutes, or until squash is soft. 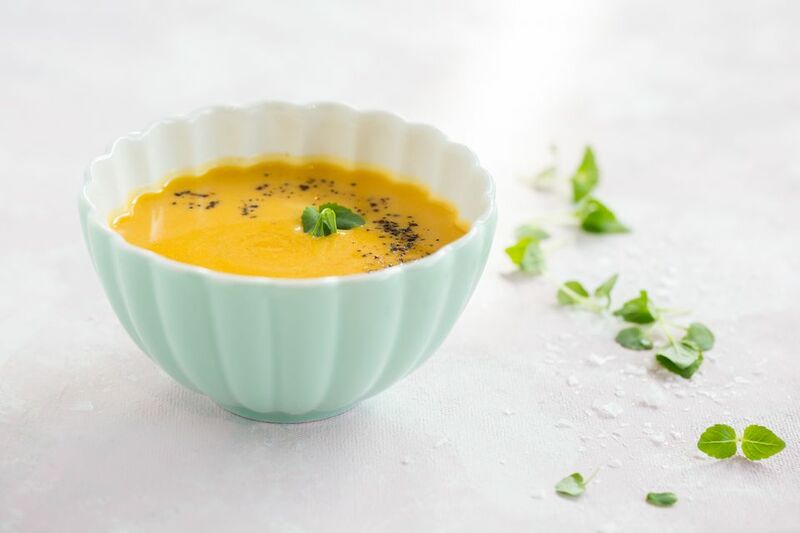 Using a potato masher or a large fork, mash the squash until smooth, or, alternatively, you can puree the soup in a food processor or blender. Stir in the soy milk and season with salt and pepper to taste (either sea salt or kosher salt or fresh ground black pepper is always best for the best flavor).